This backpack is made with high density cotton denim, heavily re-enforced, with durable inner liners, laptop sleeve pocket on the inside, inside organizer pocket, and the media pocket on strap holds a smart phone. This bag also features a secret hidden stash pocket. 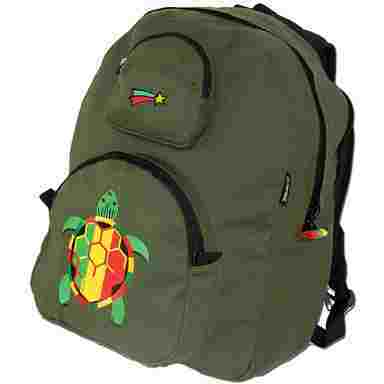 The rasta terrapin is digitally embroidered on cotton applique. Available in Green Denim.